What is a low Glycemic Index diet? Called, low GI for short, it is an index that ranks carbohydrates according to their effect on blood glucose levels. There have been numerous studies that point to the importance of keeping blood glucose levels in check. A high GI index has been implicated in obesity and serious illness, such as diabetes and heart disease. On the other hand, a low Glycemic Index diet provides balanced nutrition. The first step in starting a low GI index diet is to begin substituting low glycemic index diet carbs for high GI carbs. You might have heard that carbs are not good for you, but not all carbs are created equal. The Glycemic Index categorizes carbohydrates in a more complex manner than had been done formerly. It categorizes them based on how fast and how high they raise blood sugar compared to eating pure sugar. For example, white bread, after it is ingested, causes a rapid increase in blood sugar. Therefore, it has a high GI. It is like having a piece of chocolate. However, other carbohydrates, such as oats, cause a lower and slower change in blood sugar. Foods in a low glycemic index diet have a value of “55” and lower; foods with a high glycemic index have a value of “70” and above. According to an article published by the Harvard School of Public Health, a comprehensive glycemic index of foods was published in the July 2002 issue of the American Journal of Clinical Nutrition. This index included almost 750 foods. Subsequent to this first list, the University of Sydney in Australia maintains an updated list of almost 1,600 foods that can help you maintain a low glycemic index diet. Without worrying about specific numbers related to the GI, you can begin a low glycemic index diet by reducing the amount of carbohydrates you eat. There have been several low carb or no carb diets in recent years. Some, such as the Atkins diet, viewed all carbohydrates as a poor diet option. Followers of this diet did lose weight quickly once they cut out carbohydrates, but this diet also allowed a fair amount of high fat foods. Studies of the Atkins and other diet plans, such as the Zone, South Beach or Ornish diet, gave fairly good results in weight loss and lowered cholesterol. The bottom line is that reducing blood glucose levels promotes good health and protection against heart disease and diabetes. 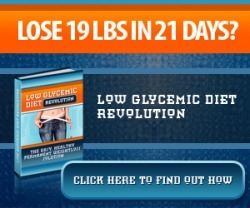 This is fundamentally why low glycemic index diets not only help you lose weight, but boost your overall health as well. For a comprehensive resource that will help you fully understand the importance of the low glycemic index diet, as well as provide information on how to follow it and enjoy your meals, visit the best glycemic index diet. When you gain a complete understanding of how various foods affect your health and well-being, it is easy to see why low glycemic index diets are so powerful for weight loss and your health.